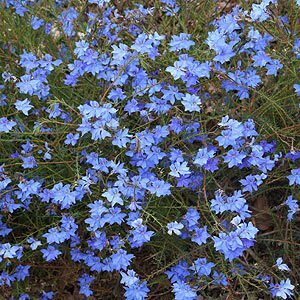 Probably one of Australia’s prettiest flowering plants is the Lechenaultia biloba or ‘Blue Lechenaultia’ a low growing bushy ground cover with fantastic blue flowers in spring. 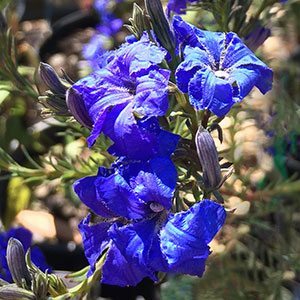 With some of the most vibrant blue flowers of any plant, try growing in a rock garden where drainage can be perfect. In poorly drained soils plants will die very quickly. It is interesting to note that this is a plant that may have more fame in Europe where it is grown in containers and in hanging baskets, than it does in Australia. Propagation is possible from cuttings, plants are low growing and form a nice mounded bush to around 0.4m – .6m. Lechenaultia formosa is a red variety well worth consideration. Like all Lechenaultia which are a group of small shrubs., Lechenaultia biloba requires excellent drainage, originally from Western Australia it is used to sandy soils and turns up its toes if it gets wet. Full sun and let potting mix dry out between watering. Prune lightly after flowering to maintain form. Lechenaultia biloba is easily struck from semi hardened cuttings taken in late summer, so give this a try as plants are actually not very long lived. Watch out for the white form or Lechenaultia biloba ‘alba’. Height – .4 to .6m. Flower colour – from pale blue to deep indigo blue. White forma are also available. Soil – Well drained, a raised garden bed in areas that become wet in winter. Moisture requirements – Water every week through first summer, after that only water during long dry periods. L. biloba ‘Old Blue Eyes’, paler blue flowers, pictured right. Also worth looking for are Lechenaultia formosa which comes in yellow orange and red forms, Lechenaultia hirsuta or ‘Hairy Lechenaultia’ and Lechenaultia tubiflora.